ProVent products have been consistently utilized in the robotic industry to control dust that may damage the robotic equipment. 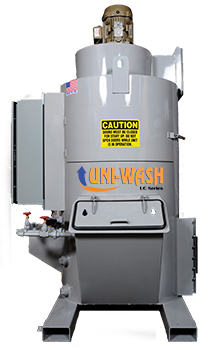 Depending on the process, many different types of dust collection have been utilized. For large operations, or for processes where the particle size is large (above 15 micron) high-efficiency cyclone collectors used singularly or in tandem can remove or reclaim between 90 and 99% of dust. For operations where the dust can be removed at the source, or the efficiency needs to be higher, cartridge collectors can contain up to 99.9% of dust. 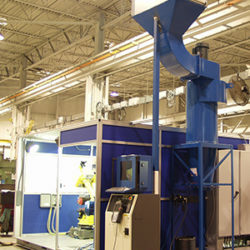 The image on the right shows a High Efficiency Tornado TXE with an after filter being used to contain process dust from a robotic operation performed in a booth.